Yes Indians love our food spicy. But, wait! Its not just the heat we crave. We also love the satisfaction of biting into something that has the perfect balance of heat, flavor and texture. Isn't that why we patiently mix together the perfect ratio of daal, rice and yogurt or dosa, sambar and chutney before taking a bite? And isn't that why we dip buttery naan into the rich gravy of butter chicken and then take a bite of crisp raw onion or green chili? Having a mouth full of spicy, tangy, salty, buttery, crunchy and even a bit of sweet all at once is just. pure. bliss. How can one get that delectably perfect bite every time? Of course you start with the big players; that steaming plate of rice or naan, spicy chicken curry, crunchy fried fish, buttery daals and deliciously seasoned vegetables but then what? Look closer. See those ever present pickles, relishes and chutneys that dot the dinner table? These are the secrets to creating that perfect bite! They give each morsel that extra uumppff! that make our meals that much tastier. Along with my own mom and mother-in-law, every aunty and friend's mom that I know has a special pickle, relish or chutney recipe that they are known for. Meals become special just by their very presence! My mom makes several different pickles and chutneys some with coconut or green mangoes and others with onions and chilies and some even with dried fish! I will be sharing one of my favorites, her recipe for Spicy Pickled Red Onions with you today. This simple condiment has a wonderful brightness from fresh lemon juice and vinegar. The acidity blends together the deep flavors of the red onions with the spicy green chilies and fresh herbs wonderfully. It is the perfect compliment to not only indian dishes but I happen to know it works really well in chicken tacos too ;) You can leave out the chilies if you prefer a milder relish. Also, it will stay for 1-2 weeks in the fridge only getting better with time. 3. Seriously, thats it. Enjoy! The long days and warm nights of summer always seem to drift away too quickly for my liking. But happily, fall's vibrant foliage, crisp air and long cozy nights come to the rescue before we have a chance to miss summer too much. While I love summer dearly, my tastebuds definitely crave the richness and comfort of the foods during fall the most. Among the ubiquitous "pumpkin-spice" e v e r y t h i n g, the versatile butternut squash shouldn't be forgotten! 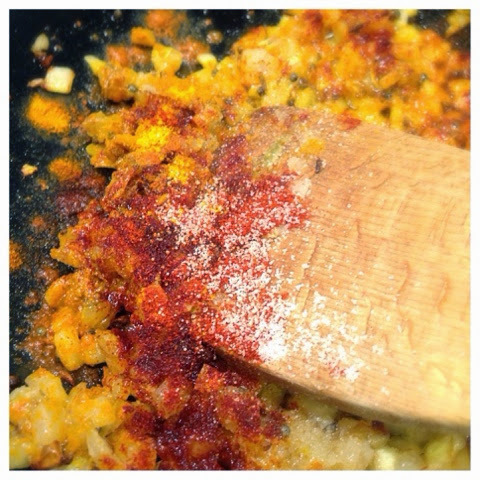 I've used this delicious squash in soups, in Thanksgiving stuffing and in the past few years I have made a tasty and simple Indian version in the Kadhai or Cheena Chatti. The sweetness of the butternut squash is slowly drawn out by the even caramelization you get from the thick cast iron Khadai. This well-known technique of cooking Indian vegetables is one that I've grown up watching my mother use and one I see used in the expert hands of my mother-in-law as well. 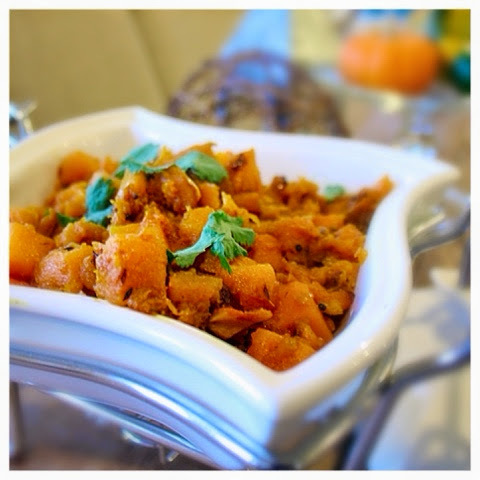 The natural sweetness of the squash pairs beautifully with the mild heat of the indian spices and transforms this simple vegetable into something wonderfully complex with full depth of flavor. 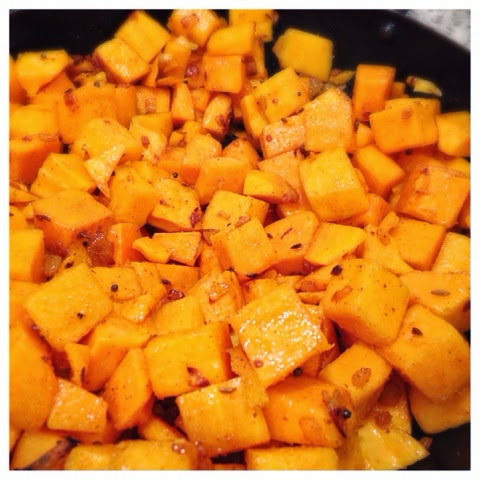 Here's the recipe for Khadai Butternut Squash. (Which happens to be vegan!) I hope you have a chance to cozy up and enjoy it! 3. Add diced onions and sauté until translucent and slightly browned. 9. 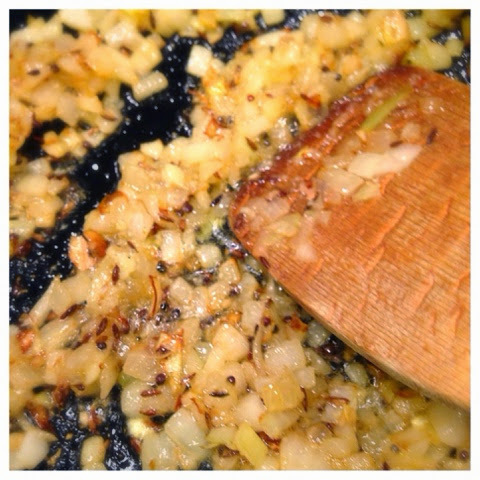 Once the squash is soft reduce the flame to low and cook another 10 minutes allowing squash to slightly caramelize. 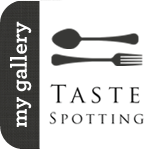 Warm, spicy, mildly tangy, salty, with a sweet caramelized crunch right at the end. Pairs perfectly with plain steamed white rice or chapati. Delish!